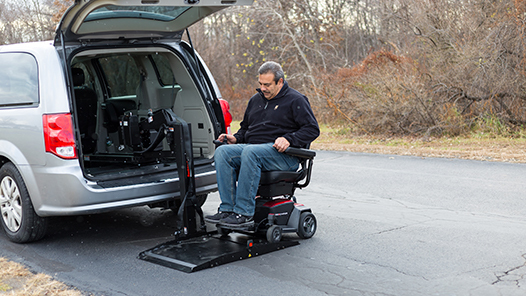 The Backpacker AVP 2.0 is an interior/hybrid vehicle lift with an adjustable platform width from 34" to 42". This lets it fit in smaller SUVs. The SUV must have a minimum of 35" opening height. HOWEVER, if the power chair or scooter is taller than this, then the taller height is what's required. This can be an issue on power chairs with Captain's seats. The customer uses the wireless or wired remote to lower the platform out of the back of the vehicle and onto the ground. The customer then drives the scooter or power chair onto the platform from either direction. The customer gets off the scooter or power chair, secures it, and then uses the remote to lift and load. 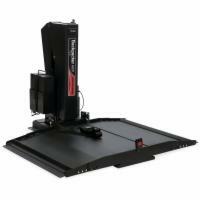 The Backpacker AVP 2.0 has a maximum travel distance from the ground of 37". Adjustable wheelchocks are included. All Backpacker lifts come with a battery pack which eliminates the need for vehicle electrical wiring. An In-Car Charger from one of our other vendors can be added if the customer wants to charger their scooter or power chair while it's in the car. If they don't want to have two separate items (battery pack and in-car charger), they can order the Multi-Purpose Battery Pack from Pride, which combines the features of the standard battery pack and the In-Car Charger.